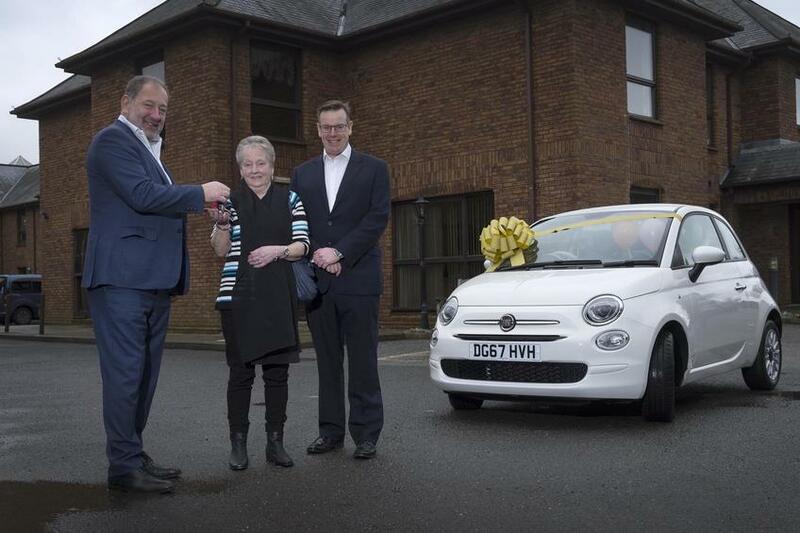 The Employee Survey prize draw winner, Betty Verran, has been presented with the keys to a Fiat 500 in Bossa Nova White, from Pete Calveley and Adrian Pancott. Betty, a carer in Kenwyn Care Home in Truro, has been an employee of Barchester for the past 24 years, working evenings at Kenwyn since the official opening in 1993. Aged 70, Betty now works part time in the home alongside her daughter-in-law. The Employee Engagement Survey took place in November last year, and was sent out to over 15,000 employees across all levels of the company to gather insight into what is important to staff and to measure and improve engagement. Everyone who completed the survey and supplied their name was entered into the draw with a chance to win the coveted car. Alongside the grand prize, 50 additional employees were also awarded a £200 gift card each. The 2017 Employee Engagement Survey, now in its third year running, had the highest number of responses to date, providing great insight into the experience of working for the company at all levels. The results from the survey will be used to improve all areas of the business and enhance employee satisfaction overall, which will further improve the quality of care that we give to our residents and patients. A year-on-year comparison of the survey results from 2015, 2016 and 2017 shows an increase in positive responses to all of the questions. The biggest shifts have been seen in the company’s approach to internal communication and employee rewards.